Salsa Chicken Instant Pot Recipe. Simple weeknight meal done in less than 30 minutes. Salsa Chicken is the perfect weeknight meal. Sometimes, I am just tired and I don’t feel like making dinner. 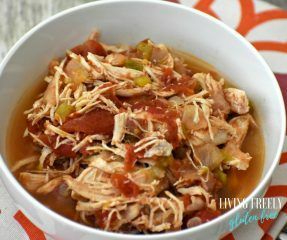 Salsa Chicken is one of those super easy and fast recipes, because I use the Instant Pot and it never disappoints. 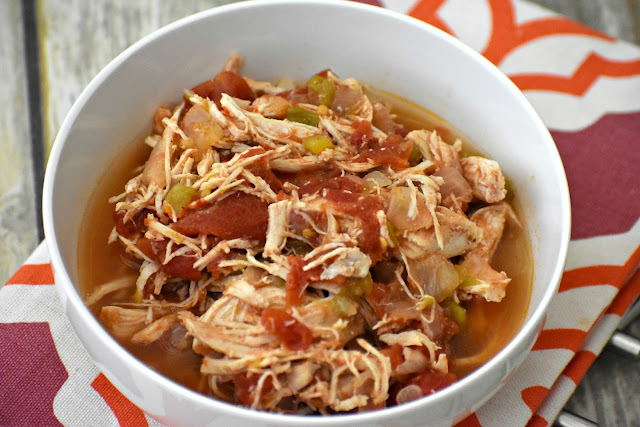 It takes 2 minutes to throw the Salsa Chicken ingredients into the Instant Pot and once its done all you need to do is shred the chicken and stuff it into your tortillas. This post contains affiliate links. 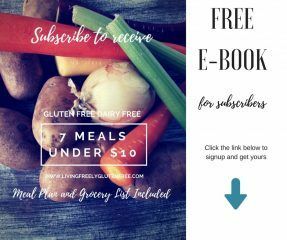 Living Freely Gluten Free makes a small percentage of any purchases made through these links. Thank you for your support. You can fill tacos, burritos, quesadillas and top nachos. Even on top of some greens to make a southwest style salad would be delish! I am gearing up for back to school and working on our family meal plan. Everyone needs a handful of recipes that you don’t need to prep, are inexpensive and you always have the ingredients on hand. Salsa Chicken is exactly that! I keep chicken in the freezer at all times. I always have onions and the rest are pantry items that I always keep on hand. You can eat these so many different ways that you won’t get tired of it. I LOVE Salsa Chicken on top of my nachos, my kids like it in a burrito or quesadilla and my husband loves it in tacos. Use the leftovers (if there are any) for a salad. So the next time you need a fast and simple meal, please give this one a try! This delicious and healthy dinner only takes 5 minutes of prep. Add all of the ingredients in your Instant Pot and cook on the chicken setting. Once done, take the chicken out and shred it, then return it to the Instant Pot. Stir and serve however you would like (e.g. nachos, burritos, tacos, and salad). Hi, I would like to give this recipe a try! With this gluten free recipe I was wondering where you found the taco shells? They look like they are good ones that won’t fall apart. May I ask where you found these gluten free tortilla shells? Sorry for the asking the question twice, it responded and said after the first comment it wouldn’t post?? ? I buy tortillas at Trader Joes usually, or the Mission brand corn tortillas. I like to fry the soft corn tortillas in a little coconut oil and then I pat them with a paper towel and then stuff them with the taco filling.